Actually, my last post was the 200th, but I was preoccupied with the heartbeat, so I missed it. Oh well, caught it now. So to celebrate, I'm giving away a gel-a-tins stamp set. You have until Monday to leave me a comment on this post and I'll pick a winner next week. We were in Lethbridge this past weekend for a visit. We got to meet our new nephew, Kale and see lots of family, which was great. Kale is a sweetheart.... but there were so many people taking pictures I didn't take any! Next time. Brad also played in a hockey tournament and won the B final, so I spent a good chunk of the weekend in an arena and got lots of cheering in. Good weekend! 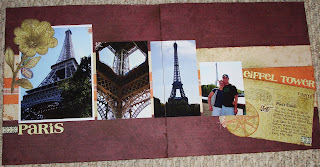 I even got a few moments to run over to Scrapbooker's Paradise and found two things I'd been searching for!! yay! I got a Bind-It-All for Christmas and haven't been able to find any coils, so I've had this great toy, sitting in my scrap room taunting me for months. Luckily, I've got some coils and I'm ready to create! I also got a few early birthday gifts! Lucky me! Remember to leave a comment for your chance to win!! Woo Hoo! I'm the first to comment! :) I love your idea about giving a prize out for commenting - I may just have to swipe that and use it on my own blog. I read your blog all the time, and love what you do with the scrapbooking - very much more elaborate than I ever got when I was doing it! Keep up the great work. Wow, 200 posts, good for you. Thanks for a chance to win! well, let me be the first to leave a comment! I enjoy reading your blog kelly, it keeps me in the loop with your life when I'm too busy to actually pick up a phone! But...on the otherhand, I also hate your blog becuase it reminds me of all the scrapbooking that I am NOT doing.